BURDEN OF HAIR LOSS OR THINNING HAIR? FOLLOW THESE 3 STEPS TO THICKER, FULLER-FURTHER HAIR! Uniquely worded with the best that nature and science has to offer, our three-step system, which is used consistently, will help promote healthier hair growth and preserve the appearance of beautiful, thicker, fuller-looking hair. It is skin care for the scalp, a whole new approach to hair care. A well-fed scalp is the basis for achieving thicker, fuller hair with more body. Our Hair Solutions Energizing System is packed with proven, powerful Oriental herbs, powered by the best modern science. No skimping, no compromises - delivering amazing results for ladies AND gentlemen. You see her with more body, bounce and shine with Hair Solutions Energizing Shampoo and Conditioner. Our hair solutions Energizing Scalp Serum delivers noticeable results after just the first few months of use. With continuous regular use, you increase the appearance of thicker, fuller hair. How best to use our system? Healthy-looking hair gets maintenance. Our Hair Solutions Energizing System is recommended for daily use. Use Energizing Shampoo and Conditioner every time you shower, to stimulate, hydrate and nourish the hair and scalp. For long-term benefits, massage Energizing Scalp Serum 15 to 20 minutes before going to bed in the scalp. Apply it every night to see the results faster and to get thicker, fuller looking hair. 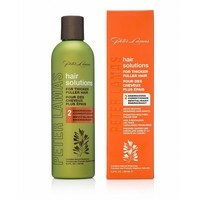 Stimulates healthy hair growth for thicker, fuller hair. Apple stem cells, Trichogen, Procapil, Baicapil, Biotin, Panthenol, Swertia extract and Oriental herbs stimulate the scalp and stimulate the hair follicles. Improves microcirculation of the scalp to help prevent premature hair loss. Helps to inhibit DHT build-up to promote healthy hair growth for thicker, fuller hair.